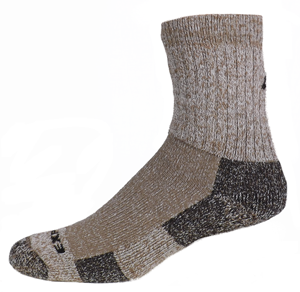 THERMAL REGULATION - Alpaca’s superior fiber insulation is warm in cool weather and cool in warm weather—helping to regulate body temp. WHETHER YOU ARE WITHIN SIGHT of the peak in frigid conditions or out for a weekend hike in July, Altera has your back - or rather your feet. 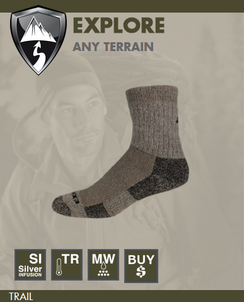 Introducing the Explore sock from Altera. Altera is based in the Southeast U.S. and works with local farms around the country to be able to offer this rare high performance fleece for the comfort of those who love the outdoors. Altera is commited to protecting the environment. Harsh chemicals are often used to remove the lanolin found in wool. Alpaca is lanonlin free so natural citrus based soaps can be used to process it.